Wikimedia Armenia organized its 6th Teachers Wikiweek which took place in Aghveran from October 29 to November 3. The total of 86 teachers have applied online to be part of the seminar and only 28 were chosen. The selection process is quite elaborate. A selection committee usually consists of experienced Wikipedian teachers and WMAM staff. They evaluate new teachers’ applications anonymously and make their final decision based on careful evaluation. The experienced teachers are being chosen based on their editing activity in different wiki projects throughout the year. Some of the experienced teachers have become wiki assistants by forming groups and helping the newcomers. Our agenda was packed with lots of editing activities. There were also discussions regarding the usage of Wikipedia and other Wikimedia projects in the school curriculum and education process. The teachers used the school textbooks and have separated those articles (related to their own field of specialisation) that are missing or are incomplete on the Armenian Wikipedia. This list will be used for other project as a recommendation list for creating and editing articles. Teachers have created and improved more than 75 articles. Our seminar was concluded by a survey. Wikimedia Armenia has organized a two day “Wiki Loves Science” editathon that ran from 3rd till 5th of November. 22 people have participated in WLS edit-a-thon. During the two days participants have enriched the Armenian Wikipedia with their professional articles. A total of 48 articles has been created during this edit-a-thon. Wikimedia Armenia has organized a workshop for high school students of Arshalyus school on the 29th of November which took place in Wikimedia Armenia office. 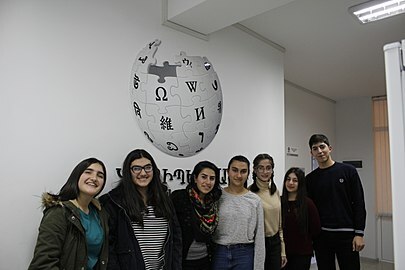 Students learned about Wikimedia Armenia as an organization, its activities, projects, future directions and also watched an exciting film dedicated to Wiki Camps! This workshop also allowed participants to improve their editing skills in various wikiprojects. After the Wikimedia CEE Meeting in Warsaw this September the CEE community has decided to launch a CEE Newsletter. The aim of the newsletter is to collect in a more consistent, reachable, reusable way stories and good practices developed in the region. On November issue of the Newsletter Armenia was represented in 2 articles written by WMAM volunteer Armine Aghayan and WMAM staff member Lilit Tarkhanyan. At the beginning of each month WMAM Education team makes the WikiClubs stats. Below is the stats for October. On November WMAM staff began working on the official website of the organization. As a result of several discussions the draft of the website was created. The website was an essential priority because with the ongoing activities carried out by WMAM the organization did not have a place to announce and keep all the records of its projects. It is planned to review the content of the website and finalize it on December. Wikimedia Armenia continues to support the creation of quality content on the Wikipedia, this time through the launching of the "I create a vital article" campaign. The campaign aims at the improvement of the articles from "1000 articles every Wikipedia should have" list with the help of the best professionals. The campaign started on the 8th December, 2017 with the "Wiki loves science" event. It will be accompanied with different editathons and will end on May 14, 2018 with a 24h editathon. The professionals interested in the editing of a featured or good articles were invited to the opening event of the campaign. To make this project happen the list of 1000 articles were refreshed and revised in order to provide it to the potential editors. The list was divided into more detailed sections taking into account the potential fields of interest. Also, the corresponding language articles were researched to find the best language to translate from. The project page was created to support the participants more effectively. Wikimedia Armenia President and Executive Director had several meetings during the month of November. On November 21, a meeting took place with the Arsen Stepanyan, the manager of "Bridge for CSOs" program carried out by Armenian General Benevolent Union (AGBU) in Armenia. Parties discussed collaboration directions, the grants opportunity provided by the program and AGBU support during organization of Wikimania 2019 in case Armenia was selected to host it. On November 23 WMAM representatives met with the Senior Adviser to the Prime Minister of Armenia on Education Gevorg Muradyan. The topic for discussion was the campaign initiated by WMAM aimed at creation of 1000 vital articles in Armenian Wikipedia. Gevorg Muradyan gave several valuable advises on how to spread the word and how to engage really valuable editors in the campaign. On November 28, a meeting took place with another Adviser to the Prime Minister Mher Terteryan responsible for public campaigns. Parties discussed possible synergies between WMAM projects with state educational and cultural programs. This page was last edited on 30 March 2018, at 07:09.